Oh, happy Wednesday. I am happy because I found a new linky hosted by Teacher by the Beach, and it's called Monday Motivation.... err... I guess I am a bit late to the party this time. 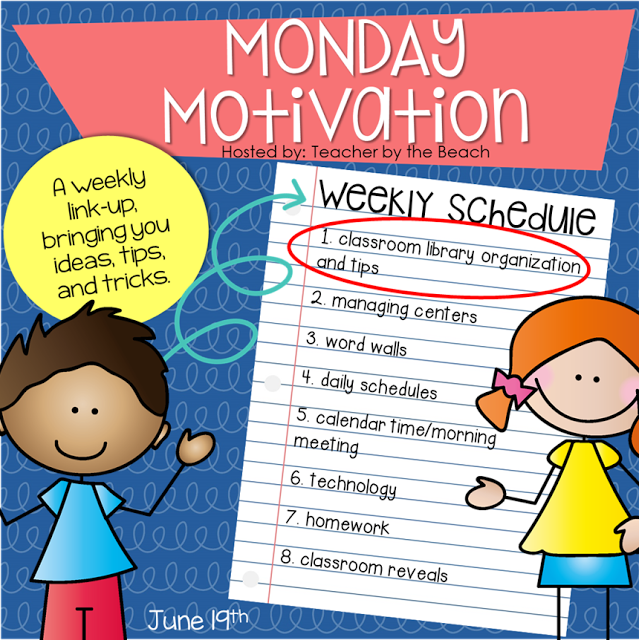 But I do have some book ideas to share for this week's topic of Classroom Library Organization and Tips. Any discussion of a classroom library needs to start IN my classroom library, or Book Nook as we call it. Yep, that is our Book Nook. I'm sorry this photo is a bit blurry. 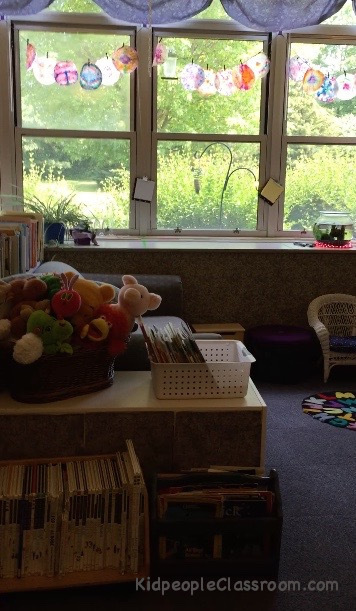 I am doing a whole series on classroom design this summer, and this photo was taken from the video. If you like what you see in this post, be sure to stop back in July for the full video and discussion. Here you see the couch a bit more, peeking out from behind the book buddy basket there on the left. 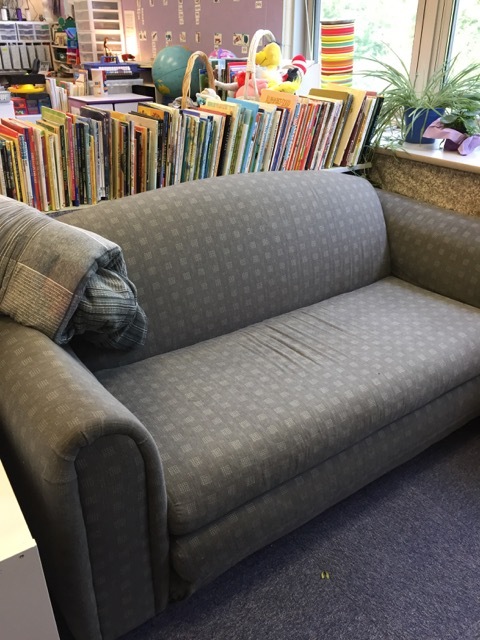 The couch is only one of several seating options in the book nook. There is a rocking chair, a wicker chair, a tuffet or footstool, Bilibos, which are a kind of rocking seat, a small set of steps, and the window seat. Then if you were to swing around to the right of this picture you would see our fireplace. I LOVE our fireplace... built and installed by the DH, of course. I tell you it is a very fun spot to hang out in. And in the winter when the snow is coming down, you swear our little LED twinkle lights are giving out warmth. 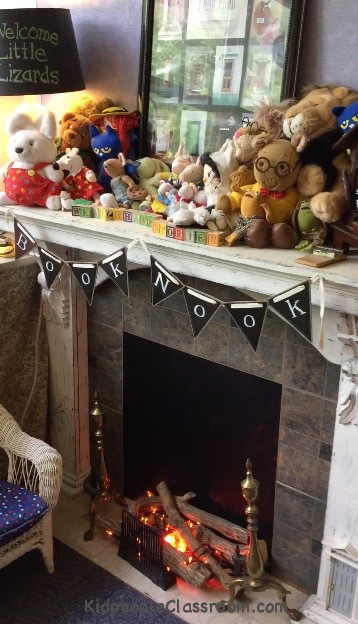 The blocks on the mantle say three different messages through the year– We all have stories. This launches our year with storytelling, both of traditional tales and our own stories. Remember reading starts with the oral piece first and kids need to hear language and use language. Then comes– We live in books. 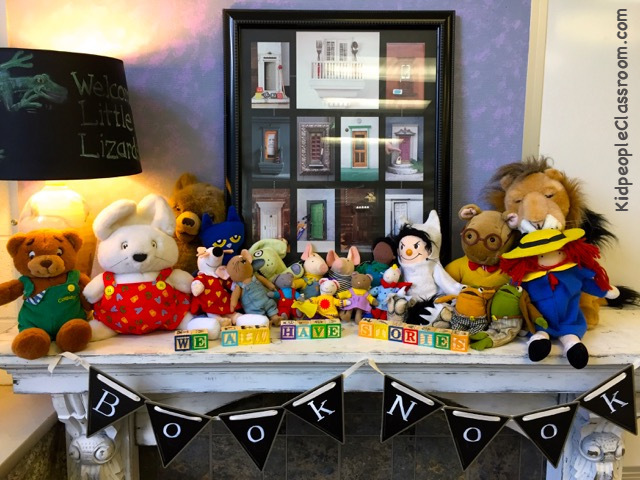 Because we really are a book-loving bunch and all those little stuffies on the mantle are characters who really do live in books... heehee. 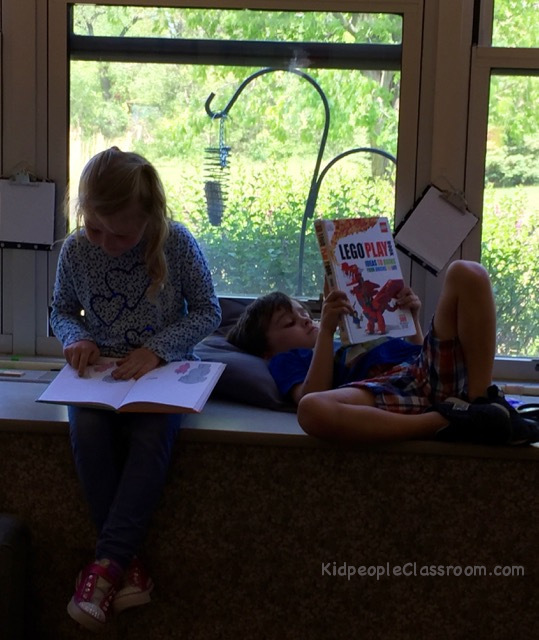 Then in the last third of the year I have to change it to– We love to read– because by this time in the year we are reading. Those three messages can be made from two sets of classic alphabet blocks, by the way. Be on the lookout as Target's Dollar Spot starts getting in the back to school stuff. That is where I found them last year for cheap. The other great thing about the Book Nook in addition to the fireplace, couch, comfy seating and collection of books, is the window. Here it is in the glorious fall. But it is even more fun to sit up and look out. And reading is always popular during free choice time when they could choose anything. Our Book Nook really sets the stage and gives a daily focus on pleasure reading... even to the Littles who aren't reading yet. The kids really love to be in there and I build in multiple times in the day when they can go in to both work and play. So what about the book organization part of this post. I am a big believer of all sorts of collections. 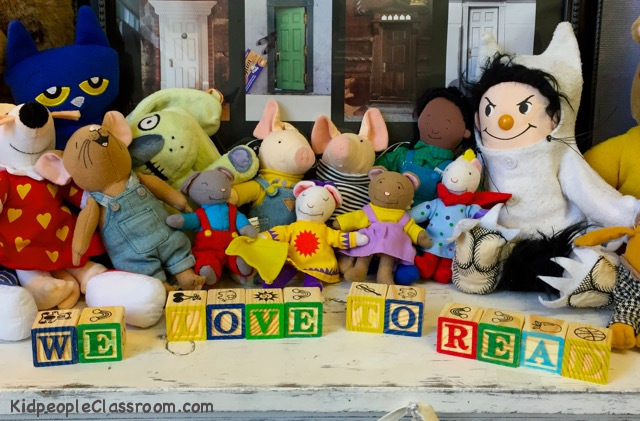 Collections from which I teach, collections that the kids can choose from, collections that give focus to our current studies. I mean lots and lots of collections. Here is the list of book collections in my classroom. Yep. A lot of books. New teachers don't despair. It takes a long time to build up your classroom library, but needless to say, I think it is a very valuable part of teaching. Do we get all these books out at once? Noooo. Are we using several collections at once? Yesss. 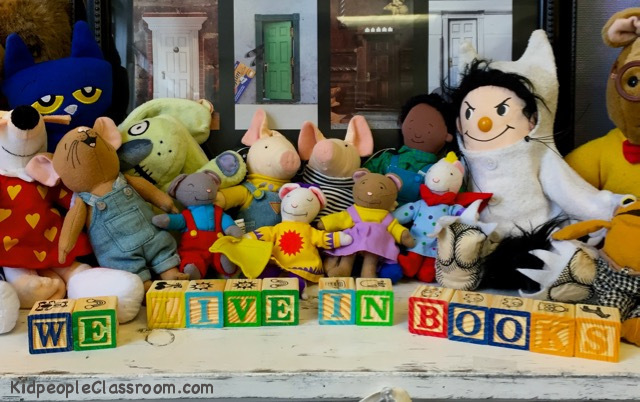 They all have their own specific purpose in helping kids become immersed in literature so we are using different groups of books all the time. If you came into my classroom would you "notice" all these books? Nope, probably not. They certainly don't all fit in the Book Nook! 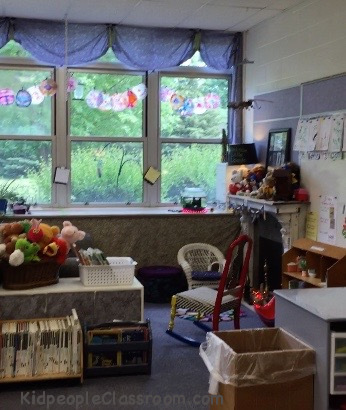 I am a big believer in keeping the visuals of the classroom as clean as possible... a big dilemma for a teacher who has been teaching a long time, has a lot of stuff, and has a small classroom. Most of my books I keep in bins and that is so they can be stashed under, over, and behind... well, everything. Even my couch is on sliders so I can get to the shelves behind it. 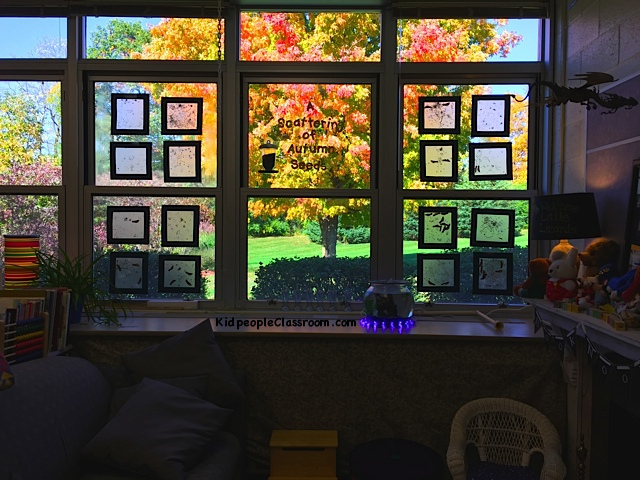 As I said earlier I am doing a series of posts on classroom organization. 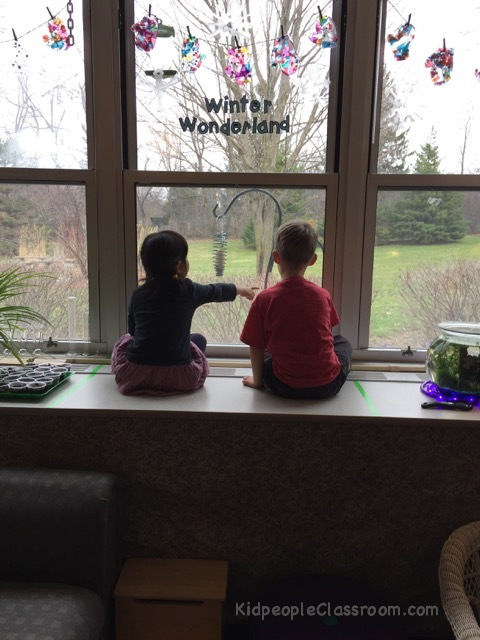 So if you are interested in keeping not only books, but lots of materials organized and accessible, and keeping an eye toward the elements that make an attractive, brain compatible, and comfortable classroom– color, lighting, alternative seating, creative storage, making spaces do multi-duty... stop by in the coming weeks. It will all be right here... look for my NEW classroom design button. Thanks, Jonathan! Hopefully taking a look at my Book Nook gave you some ideas on setting up your comfy reading area. And hopefully I'll see you again soon when I talk further about how I store and use my book collections. Here is the list of topics for Jen R's Monday Motivation yet to come. Look for some more Monday posts from me, and check out By the Beach each Monday to see what others are posting. You can click that pic up there to go right to the linky now and find more book tips. Big thanks to Jen for hosting the linky! And thanks for stopping by today! Don't forget to Pin the ideas you liked... what would I do without my Pinterest!